What another fantastic ASR Winner’s Cup event at the 17th annual Asia Superyacht Rendezvous regatta! The participating owners and their guests, captains and crews made this year truly special, said long-time ASR Cup organiser, Gordon Fernandes, heading up Asia Pacific Superyachts Phuket and Myanmar. Starting off on February 19th was the Opening Day Cocktail Party aboard the absolutely stunning S/Y La Numero Uno, Perini Navi’s first-ever constructed yacht. Welcomed by hosts Mick and Som Cotter, upon arriving by tender guests were introduced to world-renowned bartender Salim Khoury (formerly of The Savoy), mixing up his famous cocktail “The Blushing Monarch”, inspired by the late Princess Diana. Ensuring a sumptuous cuisine matched the libations was Executive Chef Fabrizio Demichelis of Phuket’s own Trattoria del Buongustaio, serving up his incredible tapas throughout the evening. Headquarters for the ASR Cup for the second year, the Sala Phuket Resort & Spa provided the best of accommodations, combining rare historical Sino – Portuguese architecture with luxury hotel facilities. The glittering gem is situation one of the most dramatic settings in Phuket on secluded Mai Khao Beach. Joining Sala Phuket Resort in warmly welcoming guests were co-sponsors Asia Pacific Superyachts, Yacht Services Thailand, Asia Pacific Boating, Charterworld.com, SEA Yachting and Deluxe Vietnam. The weather may have been a bit inclement but that didn’t stop the fun or the exciting and highly fought racing on the beautiful waters of Mai Khao Bay January 19 through 21 in Phuket, Thailand. The first superyacht racing started the next day, January 20th and S/Y Intrigue kicked things off by crossing the start line 2 seconds early, causing them to have to restart – incidentally at the opposite end of S/Y Aphrodite and S/Y La Numero Uno, giving them a big advantage with wind direction. By the first mark, S/Y Intrigue was half a leg in front of the others, by the second mark more than a leg ahead and by the third mark had lapped S/Y La Numero Uno for the win. 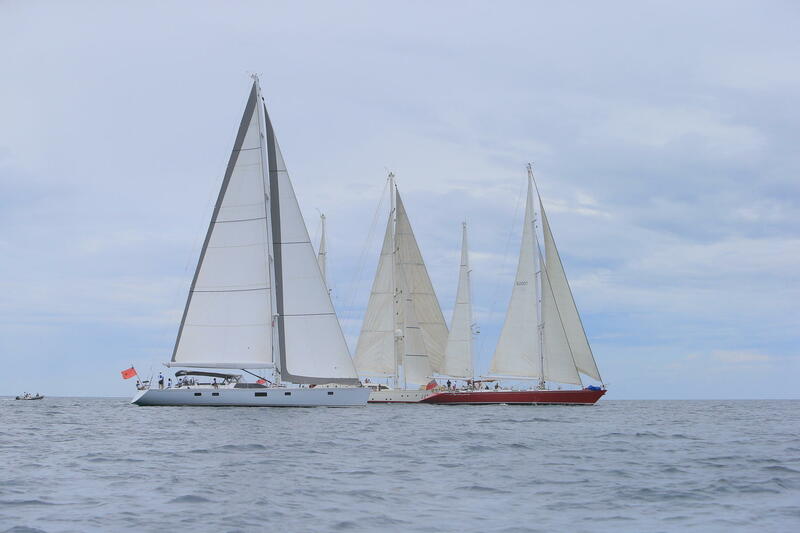 The final standing for the first racing day was S/Y Intrigue, S/Y Aphrodite and S/Y La Numero Uno. The final day of racing proved to be both exciting and unique, getting two races in just after 1 pm with great wind and a few scattered showers. Race 1 of day 2 started off fantastically, seeing a 4-second gap between S/Y Intrigue and S/Y Aphrodite by the second buoy. However, an unfortunate rip to the spinnaker of S/Y Intrigue allowed S/Y Aphrodite to catch up and maintain distance, coming in at the finish just 2 minutes behind. However, corrected time proved S/Y Aphrodite the winner, leaving both boats with one 1st and one 2nd place standing and S/Y La Numero Uno with two 3rd place standings. The final race was run on a straight up and down course using the updated handicaps, which created quite the unique finish with both S/Y Aphrodite and S/Y Intrigue both coming in at 33:05. However, because each boat had the same standings prior to the third and final race, and race three could not conclude the winner with an identical finish, a few quick phone calls were made to a World Sailing Technical Delegate, with confirmation that the winner of the second overall race would be named the champion. It was luxury sailing yacht S/Y Aphrodite named as Overall Winner of the 2018 ASR Cup regatta after two days of intense and highly competitive racing on a course marked and accompanied by expansive motor yachts and pleasure craft. In the tightly fought races S/Y Intrigue was awarded 2nd place and S/Y La Numero Uno received 3rd place in the 2018 ASR Cup regatta. Day 1 racing was followed by the popular “ASR Challenge” model boat competition between superyacht teams during the evening cocktail party. This year saw 10 teams battle it out for “The Challenge” Model Boat-Build & Racing awards, with crew teams from yachts: Aphrodite; Sunrays 1; La Numero Uno; Intrigue; Darling; Aveline; Stereden; Seraph; Siam Princess; and Sunrays 2. It was tightly fought racing, but alas, there can only be one champion and after a cheerful evening of laughter, enthusiastic applauding and a few sunken model yachts, it came down to teams from S/Y Aphrodite and S/Y Seraph. After inspection of the yachts, the intense battle began, ending after multiple heats with S/Y Aphrodite coming in first! Also winning an award, one “Best Model Boat Design” was M/Y Darling. Congratulations to the winners and well done to all crew who participated, making this year’s “The Challenge” one for the books! Attending yachts at the ASR Cup event included: M/Y Aveline; M/Y Siam Princess; M/Y Darling; S/Y La Numero Uno; S/Y Aphrodite; S/Y Stereden-Ann-Esperanz; S/Y Intrigue; and M/Y Sunrays. The vessels were a stunning vision as they manoeuvred into formation late afternoon closing day towards sunset for a Dress Parade on Mai Khao Bay! In the evening the Gala Dinner & Awards Ceremony was held on the lawns of the Sala Phuket Resort. Owners, captains and VIP enjoyed the grand finale Gala Dinner under a starry sky, a delicious 8-course meal and libations, as the sounds of Mai Khao Bay’s surf melded beautifully with the stylings of the Colin “Illy” Hill Band. During the Gala Dinner’s Awards Ceremony Captain Simon Blundell of S/Y Aphrodite happily accepted this year’s annual ASR Winner’s Cup, reclaiming his highly sought victory as the recipient for the second year in a row. Gordon Fernandes took the stage and thanked participants, saying: “Cheers to all of our guests who came from near and far to attend, we are so happy to see all of your excited, smiling faces”, adding, “And of course much appreciation to Phuket Vice Governor Norraphat Plodthong and the wonderful officials from Tourism Authority of Thailand for joining us for our Gala Dinner”.